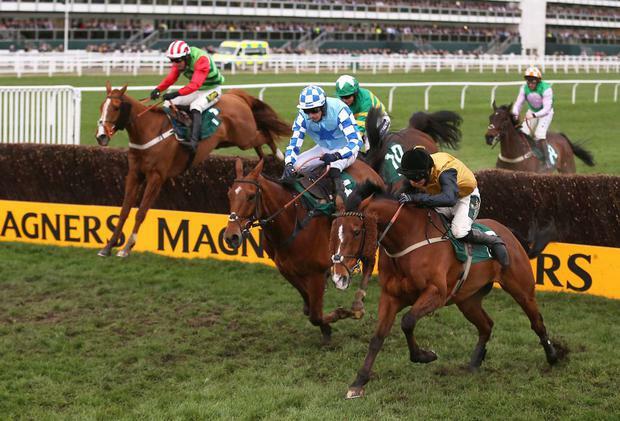 Croco Bay holds off Bun Doran to win the 2019 Johnny Henderson Grand Annual Challenge Cup Handicap Chase at the Cheltenham Festival. PRESS ASSOCIATION Photo. The 12-year-old was always close to the pace mainly set by Gino Trail, before Kielan Woods kicked on two out. It was a matter of 'catch me if you can' and Ben Case's charge was not for stopping. Bun Doran put in a strong challenge, but Croco Bay, having only his second start since finishing fifth in this race two years ago, stuck to his guns resolutely to win by a length and a half on his fourth try. Breland D'As was two and a half lengths away in third and top-weight Forest Bihan just another length back in fourth. Case said: "I'm absolutely delighted. There's a lot of work gone into him. "He's been third and fifth and the one time I really did fancy him he fell at the water, which was unlike him. He's made up for it today. It's fantastic."